This is my favorite pumpkin recipe! A dear friend in Buffalo gave it to me. 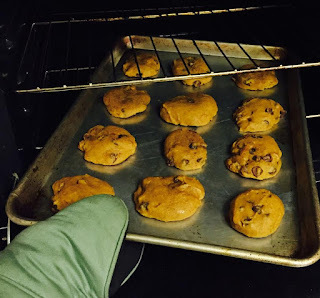 We have since moved, but I love how I think of them every time I make these delicious cookies. Mix sugar, pumpkin, egg, oil, milk, and vanilla. Stir in dry ingredients and then chocolate chips. Drop on cookie sheet. Bake @ 375 for 10 minutes. Makes about 2 dozen. I hope you create some good memories making, eating, and sharing these cookies!